'Tis the season! 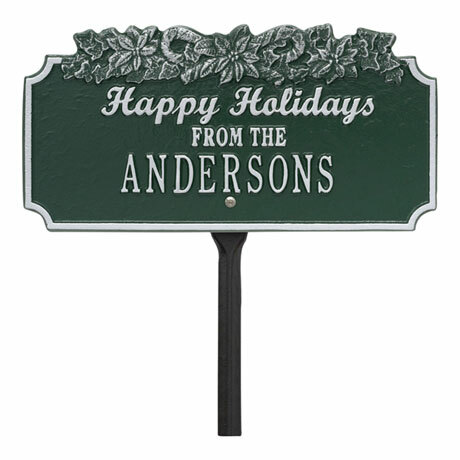 Celebrate this time of year with a beautiful, made-in-the-USA personalized lawn plaque. It features the sentiment "Happy Holidays" with sweet candy cane details and your family name. Hand-cast in rust-free recycled aluminum and painted with a weather-resistant finish, it comes with 18" stakes. Personalize with family name up to 17 characters. 14" l x 7" h. Available in 8 colors. Specify: Green/Silver, Green/White, Green/Gold, Red/Silver, Red/White, Red/Gold, Pewter/Silver, or Bronze/Gold. Allow 3 weeks for delivery. No rush delivery or gift box.